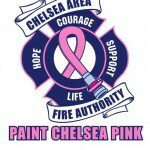 The next meeting of people interested in volunteering for the new city-wide charity event, Paint Chelsea Pink, is scheduled for Wednesday, July 25 at 8 a.m. at the fire station. The Chelsea firefighters and area businesses are organizing the breast cancer benefit on Sept. 29, in conjunction with Susan G. Komen for the Cure Foundation of Mid-Michigan. Also planned is a special hockey game dubbed “Guns vs. Hoses,” (police officers versus firefighters), on Sept. 1 from 5-8 p.m. at Chelsea’s Arctic Coliseum. All proceeds from the special game will help defray costs of putting on Paint Chelsea Pink, said Firefighter Scott Basar, the chairmen of the event. The firefighters have also recently created a Facebook page.